I have a confession to make: I buy food in plastic packaging. Much though I’d like to, I haven’t been able to eradicate plastic from my life. I did try, but fairly early on in the experiment I realised the Wannabe family would soon starve if I continued along the #plasticfree path. Of course, I’m all for companies to actually provide food not wrapped in plastic, and I buy it when I can, but until the whole world becomes #plasticfree, I’m afraid I’m guilty as charged. Except for yoghurts. Now, here’s the thing: those processed yoghurts were annoying me anyway. Full of sugar and depleted of any goodness, they are pretty much the ultimate non-health food in my opinion. But the Wannabe kids couldn’t seem to get enough of them – and I had hundreds of pots to wash weekly. I could do without those in my life, I thought. I could have the milk delivered in the morning and have fresh, homemade yoghurt by the evening for pudding. Job done. So I bought myself a yoghurt maker. You don’t need one. Apparently you can make yoghurt in a thermos flask. But mine came with the prettiest glass jars which, when filled with yoghurt and lined up in my fridge, make me happy just seeing them there. The only other item of equipment you need when making yoghurt is a jam thermometer. I already had one. It proved rubbish for making jam but really useful when making yoghurt, so I didn’t need to throw it out after all. Finally, you need some starter culture. You can buy this in dried form online or in health food shops, but the easiest source is wherever you already get your groceries. A small pot of live, plain, preferably organic yoghurt (check the label for “made with live cultures” or a list of “live bacteria”) will contain enough bacteria to transform a litre or more of milk. And yes, it will most likely come in a plastic pot but if you like what you make you can freeze a little to use as a starter next time you are planning to make some more yoghurt. Pour the milk into a saucepan and, if using, whisk in the powdered milk. If using pasteurised milk, heat it to 85C, stirring occasionally, then leave it to cool to about 46C (this process results in thicker yoghurt, as well as killing some unwanted bacteria). If UHT, simply warm it to 46C. At 46C, whisk or stir in the live yoghurt – about 3 tbsp for every 500ml. Then pour it into a thermos or your jars and yoghurt maker. Eight hours later – bingo! If not already in jars, decant and store in the fridge. It should keep for up to a week. I like to have mine either with honey or homemade blueberry compote: Blueberries, a splash of water and a sprinkle of sugar simmered together until they achieve a rich, glossy unctuousness. Delicious. And no more pesky yoghurt pots to wash and recycle. Fruit compote, honey or completely natural? 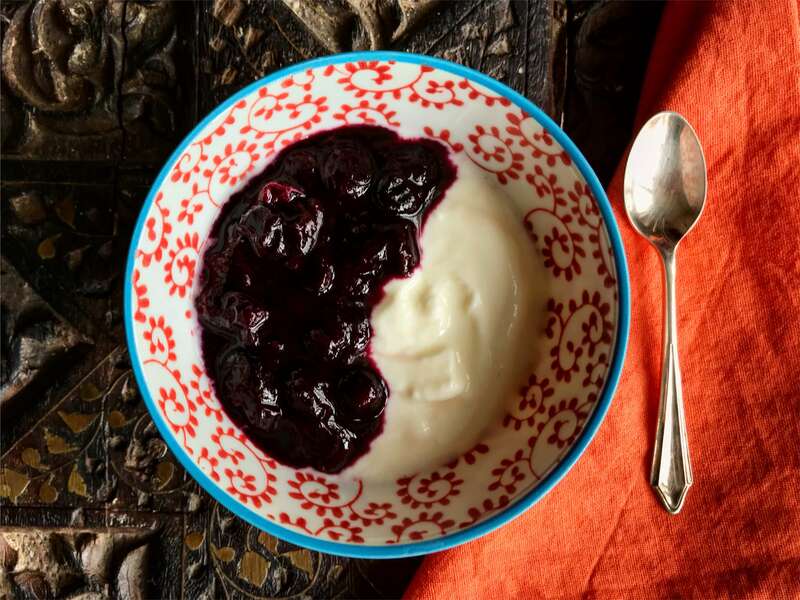 What’s your favourite way to eat yoghurt? Love this, “It proved rubbish for making jam but really useful when making yoghurt, so I didn’t need to throw it out after all.” Good new purpose for an old thing. I’m inspired by your trying to go plastic free. I’m simply ecstatic that our community recycles nearly everything that can be recycled. We throw very little trash out in a week. Yippee! I promise I’ll give real thought to making yogurt, but in the meantime I’m sticking with Fage as the least amount of sugar and best amount of protein and taste that I’ve gotten my hands on. So far! I love many Trader Joe’s products (do you have those stores? I think they are only the USA at this time), and was eating their yogurt only to compare the two–Yikes. TJ’s was not so good. Hi RoseMary. I haven’t heard of any of those brands: you can buy plain yoghurts in the UK which are much better for you than the ones with added sugar, but that doesn’t tackle the plastic issue. You used to be able to buy yoghurt in the UK in little glass jars but I haven’t seen those for a while. And while I’m all for recycling where possible, I still despair when I look at the amount of stuff we send to get recycled. Surely better to re-use and avoid single-use plastic (or single use anything – except possibly tissues!) for that matter!? Good work Monika, and it does look tasty in that lovely bowl (first Buzz and Woody, then my bowl…anything else you need??). I prefer a thick yoghurt, is it easy to make Greek Yoghurt do you know? My mum used to make yoghurt in a Thermos in the fridge, she even kept the bees that made the honey to go on the yoghurt, but then it was the 1970s. On one occasion, to our great delight, the yoghurt came out rather fizzy and faintly alcoholic. Beg as we might she never did replicate that recipe. Back to the yoghurt: I think to make Greek yoghurt you have to strain it. Which wouldn’t be hard, but a bit of a faff. I find it gets thicker if you leave it in the fridge for a few days. Or you could try experimenting with adding a bit more milk powder…? Yay to solid soap. Who’d have thought?! Hi Sara. Thanks for your post. I haven’t made non-dairy yoghurt myself but apparently it works the same way although you also need a thickener otherwise it will not set. It also works best with homemade non-dairy milk and you’ll need to buy a starter culture rather than use shop-bought yoghurt. Do let me know how you get on if you decide to give it a go! As for your overnight oats – they are a great breakfast and a fantastic way to start the day.